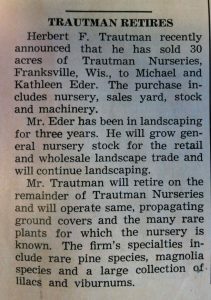 In 1927, August Trautman and sons Herbert and Carl started Trautman Nurseries on what is now 5300 W. Hwy. K Franksville, Wis. They specialized in Lilacs, Magnolias, rare Pines, and Evergreens. From its start in 1927, Trautman Nurseries relied on its reputation of doing only quality work. It was known for the best home landscaping and commercial landscaping in SE Wisconsin. They won a National award during the 1950’s for their landscaping design and planting of the Johnson Wax building in Racine while working with the legendary architect Frank Lloyd Wright. The Trautmans also designed and planted many of the larger churches and cemeteries in the Milwaukee, Racine and Kenosha areas. Herbert’s father, August, and brother, Carl, passed away and Trautman Nurseries was operated by Herbert and his wife Gertrude. In 1973, they sold about thirty of the forty-five acres to Michael and Kathy Eder. Michael Eder got involved in the landscaping industry while working for his father. He started doing sod jobs for his dad who was the sales manager at Burmeister Sod Farms in the 1960s. Michael would help his father on weekends when he was in high school. After his college years, Michael became an English teacher in Milwaukee, and married Kathy Sheahan, a chemist at Johnson Wax. He continued to do various landscaping jobs on the side until the purchase from the Trautmans – it was then that the Garden of Eder was born. For some beautiful landscape designs for Southeast Wisconsin feel free to check out our plant list or photo gallery. To learn more about the Garden of Eder and why we’re your best choice for affordable commercial and home landscaping, come out to our unique garden center and nursery, or give us a call at 262.835.1000 or email. We’re always happy to meet friends!